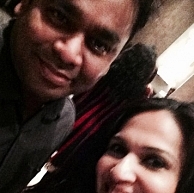 With the selfie craze going strong, the most recent is by Kochadaiiyaan director Soundarya Rajnikanth Ashwin with none other than 'Isai Puyal' A R Rahman. Soundarya posted a picture on Twitter saying that Rahman had recently held a Kochadaiiyaan success party for the music team! “Kochadaiiyaan was one of the toughest movies to score and mix for, due to the responsibility and role, music had in the narrative. Kudos to my whole team for coming through! We had to move forward on many sensibilities and step back for some others. We consciously stayed away from conventional massy numbers. With confidence in the script, we tried to stay true to dance numbers that were intrinsic to the setting of the movie and heighten the emotion”. Indeed a good gesture by the Maestro for thanking his team in pulling off a wonderful film! People looking for online information on A R Rahman, Kochadaiiyaan, Kochadaiyaan, Soundarya Ashwin will find this news story useful.